Experience and aromatic punch with the Hurraw! 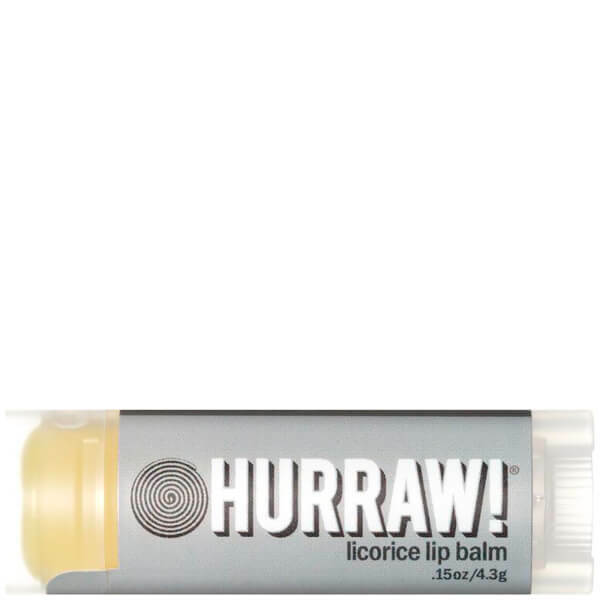 Licorice Lip Balm; an ultra-hydrating formula that cares for skin using premium organic, vegan and raw ingredients. Perfect for liquorice lovers, the smooth and creamy balm is enriched with a sweet, skin-loving blend of Coconut Oil, Cocoa Seed Butter and Olive Oil, which deliver a nourishing veil of hydration to lips. The twist-up stick is complete with a delicious dose of Anise Seed Oil, which lends the balm a natural sweetness. Expect a smooth and hydrated pout that is calm, comfortable and free from dryness. Please Note: It is advised to avoid anise seed oil when pregnant. Prunus Amygdalus Dulcis (Sweet Almond) Oil, +Euphorbia Cerifera (Candelilla) Wax, *Cocos Nucifera (Coconut) Oil, *Simmondsia Chinensis (Jojoba) Seed Oil, *Theobroma Cacao (Cocoa) Seed Butter, *Ricinus Communis (Castor) Seed Oil, Olea Europaea (Olive) Oil, *Pimpinella Anisum (Anise) Seed Oil, Tocopherols (Sunflower). *Organic & Cold Pressed.